This page contains links to papers and algorithms written by Jeremy Knight in conjunction with course taken from the graduate mathematics program at Texas A&M university. This is Jeremy Knight's presentation link for the T.A.M.U. final oral exam for the Masters of Mathematics. 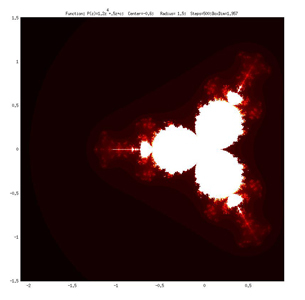 This is a link to web-pages, papers, and algorithms that I wrote to explain and demonstrate the use of applying the Finite Element Method to finding solutions of the Poisson Problem. Numerical Solutions of the Navier-Stokes Equations. This is a project that I am currently developing to create a rigorous Matlab algorithm for finding numerical solutions to the Navier-Stokes equations at low Raleigh's numbers. The three body problem is a dynamical system problem modeling the chaotic path of three orbiting bodies affected by Newton's laws of gravity. A lesson for students to learn about the Riemann sums and explore them using RiemannSums2.m which produces the plot shown to the right. The following Maple algorithms employ iterative algorithms to acquire numerical approximations. Newton's Method for finding roots. Random Prime - generates a large prime number of given length. Analyzing the sensitive dependence on initial conditions of an insect population. Analyzing the chaotic behavior of 3 bodies in space whose orbit is affected by the combined gravitational pull. ithms for applications in dynamical systems and chaos problems. 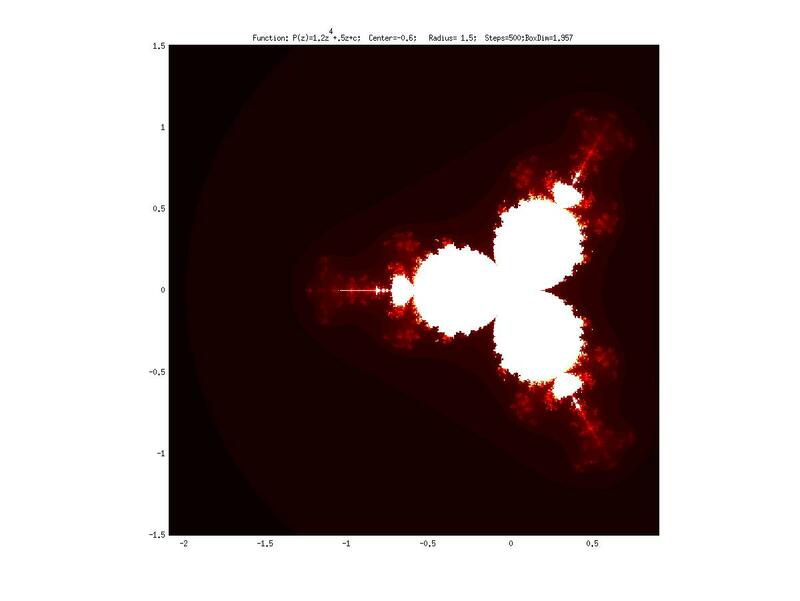 mandleset.m - plots the Mandelbrot set for a given function f(z). 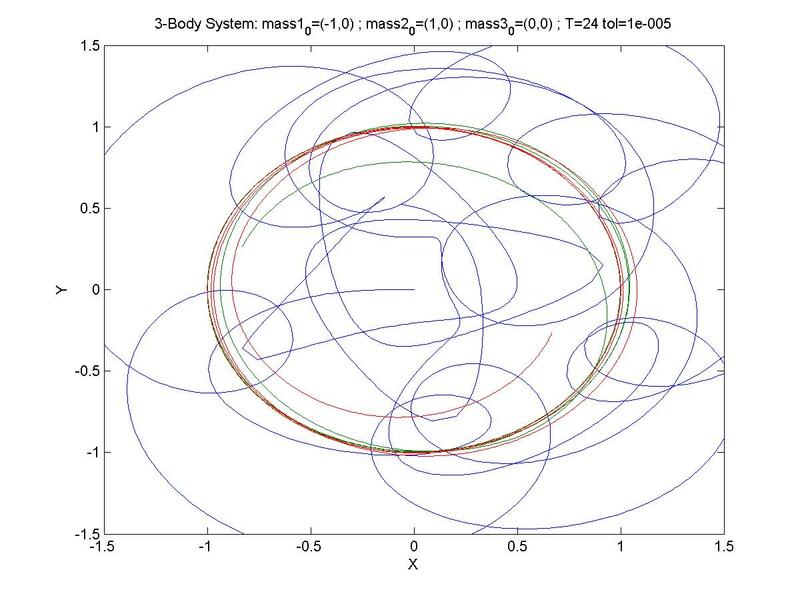 threebody_script.m ; threebody.m - plots the path of the 3-body problem described above. Download both files to the same directory and run threebody_script.m. The second file contains the ODEs. Example plot to the right. twobody_script.m ; twobody.m - plots the path of two bodies in space affected by gravitational pull. Download both files to the same directory and run twobody_script.m. The second file contains the ODEs. lyapunov.m - calculates the Lyapunov exponent for a given set of 1-dimensional data to determine the chaotic nature of the data. A great tool for demonstrating how function families transform.